Le Cadeau, French for “the gift,” began in 1997 when Tom Mortimer and his wife, Deb, located exceptional vineyard property within the Chehalem Mountains AVA in Oregon’s Willamette Valley. 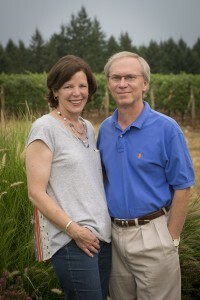 Tom’s passion for wine collecting and his love of Oregon finally merged with the purchase of the 28-acres of raw hillside that would soon become Le Cadeau Vineyard. After the tedious two-year process of preparing and clearing the vineyard land, the Mortimers planted their first 6-acres of Pinot Noir, producing the first vintage of Le Cadeau in 2002. Today, Tom and Deb focus on meticulous farming, believing that ultimately great wine traces its roots back to the vineyard. While Le Cadeau Vineyard may be a small site, it has a number of diverse clones, soils, and aspect components that are used to build complexity into the wines. Micro-farming practices are put to work in sections as small as one-quarter acre. The entire vineyard is sustainably farmed. All this detail brings the gift of Le Cadeau wines themselves. Made exclusively from estate-grown Pinot Noir, clonal diversity adds aromatic nuance and rich flavor profiles to the wines while the volcanic basalt soils add lingering minerality on the finish—a characteristic prized in the great wines of Europe. 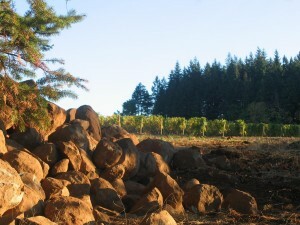 The Mortimer’s artisanal efforts yield a paltry 800 to 1,200 cases of Pinot Noir per year. With broad critical acclaim and demand from leading restaurants in the U.S. and Canada, the Le Cadeau wines can be difficult to find. Come visit and taste with Le Cadeau Vineyard at the Seattle Wine and Food Experience, Sunday February 21. Tom Mortimer and Megan Markel, National Sales Manager, will be on hand to chat about Pinot Noir, the Le Cadeau vineyard estate, and to share a selection of current releases. If you’re unable to visit during the Seattle event, Le Cadeau looks forward to hosting your visit at their Dundee, Oregon tasting room in the heart of the Willamette Valley.